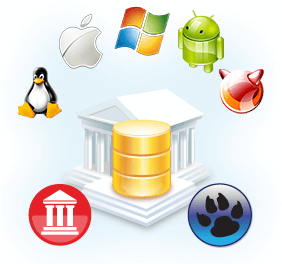 MySQL Data Access Components (MyDAC) is a library of components that provides direct access to MySQL and MariaDB from Delphi and C++Builder including Community Edition, as well as Lazarus (and Free Pascal) on Windows, Linux, macOS, iOS, and Android for both 32-bit and 64-bit platforms. 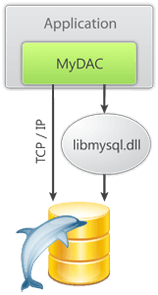 Applications based on MyDAC can connect directly to MySQL server or work through the MySQL client library. MyDAC is designed to help programmers develop faster and cleaner MySQL database applications. 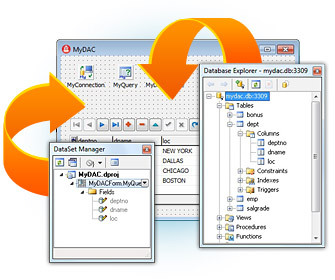 MyDAC is a complete replacement for standard MySQL connectivity solutions and presents an efficient alternative to the Borland Database Engine (BDE) and standard dbExpress driver for access to MySQL. MyDAC-based DB applications are easy to deploy, do not require installation of other data provider layers (such as BDE or ODBC), and that's why they can work faster than the ones based on standard Delphi data connectivity solutions. Moreover, MyDAC provides an additional opportunity to work with MySQL directly without involving MySQL client library. By providing access to the most advanced database functionality, MyDAC allows developers to harness the full capabilities of the MySQL server and optimize their database applications. 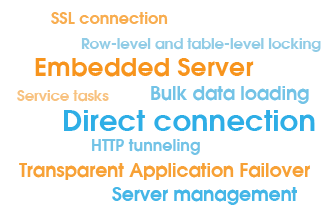 MyDAC provides complete support of Embedded server, secure connection and MySQL administration tasks. MyDAC is a cross-platform solution for developing applications using various IDEs: RAD Studio, Delphi, C++Builder, Lazarus (and FPC) on Windows, macOS, Linux, iOS, Android, and FreeBSD for both x86 and x64 platforms. MyDAC also provides support for the FireMonkey platform, which allows you to develop visually spectacular high-performance desktop and mobile native applications. We provide various GUI tools that will increase your productivity: dbMonitor allows monitoring activity of your DB applications, Dataset Manager simplifies DataSet and DB controls tweaking, dbForge Fusion for MySQL provides an easier way to explore and maintain existing DBs, design compound SQL statements and queries, as well as manipulate data. Develompent for iOS and Android mobile devices using MyDAC becomes still easier, as MyDAC allows your mobile applications to work with MySQL database as simply as desktop applications do. Our product supports MySQL servers up to 8.0, MariaDB servers versions up to 10.x. We also provide compatibility with Microsoft Azure Database for MySQL and Google Cloud for MySQL. Our product is compatible with the latest IDE versions and editions including Community Edition: Embarcadero RAD Studio 10.3 Rio, Delphi 10.3 Rio, C++Builder 10.3 Rio, Lazarus (and FPC). It is also compatible with the previous IDE versions since Delphi 6 and C++Builder 6. If you want to make custom correspondence between MySQL Server and Delphi data types, you can use a simple and flexible Data Type Mapping engine provided by MyDAC. Use our freeware dbMonitor tool to monitor and analyze all the DB calls made by your application using MyDAC. dbMonitor performs per­component tracing of SQL statement execution, commits, rollbacks, etc. This year we upgraded to professional. We implemented the backup system in our software. One of our customers is happy to say that your tool saved their business. Taco Wijtzes, CEO of QMS Software, WFC Food Safety.